McDOUGALL, JOHN, manufacturer and financier; b. c. 1825 in Berwickshire, Scotland; m. secondly Mary Cowans*; d. 29 Aug. 1892 in Montreal. John McDougall came to Lower Canada with his parents in 1832. While he was still a young man, he began to make his way in industry by learning the trades of mechanic and iron caster in the employ of William Burry, whose factory was on the Lachine Canal in Montreal. In 1854 he became his partner in William Burry and Company, entitled to a third of the profits. From its inception the enterprise enjoyed the financial backing of Alexander Walker Ogilvie*, who also awarded it many contracts for manufacturing and maintaining the machinery in his flour-mills. When Burry died in March 1858, McDougall bought his share for $10,878.29 and, having become the sole owner, decided to concentrate all his activity on manufacturing precision articles of iron and steel, a field in which he and his workers had acquired some competence. In a burst of enthusiasm he proudly signalled his beginnings by immediately renaming the company Caledonia Iron Works. Under McDougall’s management the firm specialized in the manufacture of millstones, but also made to order many items of iron, assorted equipment for sawmills, heavy machinery, steam-boilers, stationary machines, and pipes of all kinds. During the 1860s the firm was also the authorized distributor of various instruments, including a hydraulic turbine wheel with the trademark “Leppel”. In 1871 the annual output of McDougall’s shops rose to $140,000, a sum representing a quarter of the value of transportation equipment produced in the Montreal region. The 60 men who worked there represented 12 per cent of the work-force employed in this field and received 20 per cent of the total wages. By 1881 McDougall had 300 skilled workers. During the same period he obtained large contracts from the city of Montreal and neighbouring municipalities to supply and install pipes and fire-engine equipment. The firm enjoyed increasing and uninterrupted prosperity. By 1864, when he paid off his debt to the Burry estate, McDougall had decided to take advantage of the spin-offs to the iron and steel industry from the boom in railway construction in the early 1860s, and he tried his hand at manufacturing wheels for trains. To secure sufficient clients, in December 1864 he went into partnership with Alfred Brown, a well-known Montreal iron dealer, forming John McDougall and Company. Their foundry was constructed behind the buildings of the Caledonia Iron Works on Rue William, and the two companies were managed from a single downtown office at 22 Rue du Saint-Sacrement. McDougall kept for himself only a third of the new company’s profits, but in 1873 he ended the partnership, purchasing Brown’s share. McDougall had become a close friend of Louis-Adélard Senécal*, the most important railway builder in Quebec, and he no longer needed a salesman but rather a good accountant. He therefore invited Robert Cowans, his brother-in-law, to become his partner and offered him a third of the firm’s profits in exchange for his services. Their partnership, which was projected to last for three years from 25 April 1876, was neither renewed nor cancelled. Cowans had a hand in all McDougall’s financial plans (in 1890 he would even obtain a power of attorney to act alone in the name of John McDougall and Company). Although the Canadian economy was suffering from the great depression of 1873–79, the iron and steel plants, which supplied the railway companies, were becoming more prosperous every year. The cast iron that McDougall used came mainly from the United States. However, from 1863 he had taken an interest in the Saint-Maurice ironworks, which produced iron well known for exceptional properties of crystallization in die-casting, a quality essential for producing the steel band encircling the wheels of railway cars. He signed agreements to purchase its entire output with owner John McDougall* of Trois-Rivières – a namesake, but as far as is known not a relative. After the latter’s death in 1870 he made an unsuccessful attempt to acquire the works. Disappointed, he turned to the Saint-Pie-de-Guire ironworks on the south shore of the St Lawrence, which he purchased in 1874 and kept going until 1881. In 1880 he had begun operating a larger industrial complex at Drummondville, consisting of two blast-furnaces that could produce seven to eight tons of iron daily. From 1884 until 1910 the company took advantage of the National Policy, which had been introduced by Sir John A. Macdonald’s government, to obtain subsidies available for domestic production of iron. The Drummondville ironworks were regarded as a division of the Montreal foundries, to which they supplied until at least 1890 about a third of the 45 tons of cast iron they used every day. McDougall later lost interest in the ironworks and production continued at a slower pace until it was sold to the Canada Iron Corporation (now Canron) in 1908. McDougall’s change of attitude followed the failure of the attempt he made in 1883 in collaboration with Senécal to dominate the exploitation of bog iron in the province by taking over the Radnor ironworks on the Rivière Saint-Maurice. These facilities, belonging to the estate of George Benson Hall*, one of the richest lumber barons in Quebec, held timber and mining rights within an immense territory on both sides of the St Lawrence and they would have given him the control he had long sought. But they were taken over, with American help, by George Edward and Thomas Joseph Drummond of Drummond, McCall and Company of Montreal, his biggest rival, and thenceforth competition intensified. McDougall then turned to purely financial transactions, always following in the wake of Senécal, the financial backer of the provincial Conservative party. He had financial interests in numerous companies, particularly the Richelieu and Ontario Navigation Company, of which he was a director from 1882 to 1887, the period when Senécal headed the firm. He was also connected with the North Shore Railway financial syndicate (of which Senécal was the guiding spirit); it bought the line in 1882 and resold it to the Grand Trunk at a profit of nearly a million dollars. That year, along with his former partner Brown and others, McDougall formed a syndicate backed by the Bank of Montreal, to which the provincial government awarded a bond issue of $1.5 million. He was also, throughout his life, the main financial backer of the Cumberland Railway and Coal Company of Springhill, N.S., which he and Senécal had helped to found in the early 1860s. 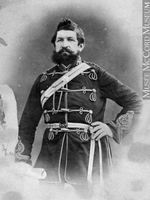 Along with Cowans and Senécal, he served on the boards of the Jacques-Cartier Union Railway Company and the Lachine and Hochelaga Railway Company for a number of years. Despite his lack of daring, his fear of taking risks, and a proverbial Scottish caution in business matters, John McDougall made his way into the industrial and financial circles of the bourgeois élite in Montreal through his connections with Senécal. When he died in 1892 at his summer home in Maisonneuve on Montreal Island, he left his five children a fortune consisting of a large number of stocks and bonds in numerous Canadian companies, movable property, and real estate. His son, Edgar Mill, took over the business in collaboration with Robert Cowans, and subsequently became head of the Canada Iron Corporation, to which in 1908 he transferred his family’s interest in the Drummondville ironworks. ANQ-M, CE1-125, 31 août 1892; CN1-208, 15 déc. 1864, 19 mars 1873; CN1-373, 10 mars, 28 juin 1858; 4 juill. 1859; CN1-438, 25 avril 1876. BE, Drummond (Drummondville), reg. B, 36, no.26075, 15 août 1890; Montréal, reg. B, 54, no.41879, 17 nov. 1908. NA, RG 31, C1, 1871, Montreal. QUA, 1004, Richelieu and Ontario Navigation Company, minutes, 1882–87. Geological Survey of Canada, Report of progress from 1866 to 1869 (Montreal, 1870). Que., Statutes, 1902, c.114. La Minerve, 1865–70; 2 avril 1874; 1er févr. 1875; 5 juill. 1876; 2 mai 1877; 12 mars, 17 avril, 11, 15 juin, 17 juill., 17 déc. 1883. Borthwick, Hist. and biog. gazetteer, 443–44. Canadian biog. dict., 2: 319. Montreal directory, 1865–66: 54, 92, 210. E. [R.] Arthur and Thomas Ritchie, Iron: cast and wrought iron from the seventeenth century to the present (Toronto, [ 1982]), 12–13. W. J. A. Donald, The Canadian iron and steel industry; a study in the economic history of a protected industry (Boston and New York, 1915), 58–62, 77, 111, 254, 291. Ève Martel, “L’industrie à Montréal en 1871” (thèse de ma, univ. du Qué., Montréal, 1976), 84. Maurice Milot, “Les forges de Drummondville, 1880–1911: fin d’une industrie artisanale au Québec” (mémoire de ma, univ. du Qué., Trois-Riviéres, 1984). J. M. and Edward Trout, The railways of Canada for 1870–71 . . . (Toronto, 1871; repr. 1970). Marc Vallières, “La gestion des opérations financières du gouvernement québécois, 1867–1920” (thèse de phd, univ. Laval, Québec, 1980), 123–24, 212. Maurice Milot, “Les forges de Saint-Pie-de-Guire, 1868–1881,” Les Cahiers nicolétains (Nicolet, Qué. ), 5 (1983): 81–139. Maurice Milot, “McDOUGALL, JOHN (d. 1892),” in Dictionary of Canadian Biography, vol. 12, University of Toronto/Université Laval, 2003–, accessed April 22, 2019, http://www.biographi.ca/en/bio/mcdougall_john_1892_12E.html.